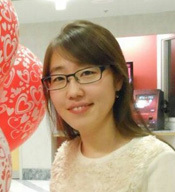 Dr. Moonsun Choi (Curriculum and Instruction Specialist) is a teacher-researcher with teaching experience in South Korea and the U.S. in a variety of settings, including an urban public school, private institute, and local educational center at the secondary and university level. 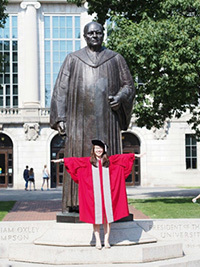 She earned her bachelor's and master's degrees in social studies education from Sungshin Women's University in South Korea and received her PhD in Social Studies and Global Education with a focus on digital/global citizenship education at the Ohio State University. Her research interests include digital and global citizenship education, Internet-infused teaching, and social studies teacher education. From her teaching and research in Korea, Dr. Choi acknowledged that the burgeoning use of digital technologies and ubiquitous accessibility to the Internet in education is inevitable in a networked and globalized society. For example, Korea's introduction of "Smart Education", which incorporates digital devices into teaching, develops digital textbooks and uses a cloud-based education system, has transformed traditional ways of teaching and learning. However, when she worked at Sungshin Girls' High school in 2009, she found that most students were still struggling to identify themselves as global and digital citizens even though they were highly technologically savvy. Despite the importance of hardware-based educational innovation, Dr. Choi realized that advanced information technology and its infrastructure did not automatically nurture global/digital citizens in the 21st century. For this reason she decided to begin further study in the United States. As a doctoral student and post-doctoral researcher at OSU, she conducted several research projects in developing digital/global citizenship scales, designing an online tool for mobile learning, and creating online educational content for teachers. Her research papers have been published in highly cited journals in Korea and the U.S. (See below for more information). She is currently the curriculum and instruction specialist for the Center for Global Awareness, developing specific criteria/standards, sufficient content, and study questions for Global Awareness Conversation and Study Program. Dr. Choi's long-term professional goal is to incorporate a concept of digital citizenship into global education. Her accumulated research work will offer the possibility for more in-depth study on global education, building digitally and globally situated curricula and instruction, assessment, and professional development. Dr. Choi moved to Albuquerque in September 2016 after her husband, Dr. Hong started to work at the Air Force Research Laboratory. They met in a dissertation writing class in 2014 and married in 2016. Interestingly, they had celebrations in three different places. In Columbus, OH they had a small ceremony with their close friends on Valentine's Day. After that, they had a reception with their relatives and friends in Korea and finally had a destination wedding in Maui, HI with their immediate family in March. They are now expecting a baby boy in July 2017. Both of them love the weather and are enjoying the peaceful atmosphere in Albuquerque. Choi, M., Glassman, M., & Cristol, D. (2017). What it means to be a citizen in the Internet age: Development of a reliable and valid digital citizenship scale. Computers & Education. 107, 100-112. Choi, M. (2016). A concept analysis of digital citizenship for democratic citizenship education. Theory and Research in Social Education. 44(4), 565-607. Choi, M., & Park, H-J. (2016). Predictor variables influencing undergraduates� sense of digital citizenship. Theory and Research in Citizenship Education in Korea, 48 (3), 213-239. Choi, M., & Park, H-J. (2015). A validation study on the Korean digital citizenship scale through exploratory and confirmatory factor analysis. Theory and Research in Citizenship Education in Korea, 47 (4), 273-297.